Fourbanger is a powerful pop-punk band based in Mesa, Arizona. 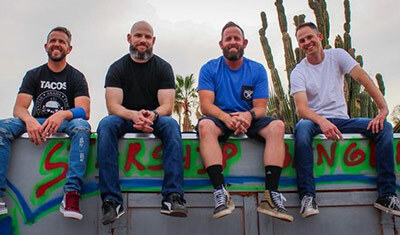 Influenced by bands like Strung Out, 88 Fingers Louie and others, Fourbanger was born during the 90s punk rock revival and fuses harmonious vocals and tantalizing guitar riffs with pop melodies, creating a high-energy show you won’t want to miss! Check out their latest hit “The Eagle Has Landed,” and get ready for a rocking show on The District Stage.